Do the drawbacks of the 2018 iPad Pro outweigh its advantages? The latest iPad Pro includes the most significant changes Apple has made to its tablets in years. There’s USB-C instead of Lightning, Face ID instead of Touch ID, and the device is more portable. In some ways it’s better than a MacBook. But that’s not to say Apple got everything right. The 2018 iPad Pro has problems noticeable enough to leave me questioning whether I made the right decision buying one. My first twinge of regret came when my credit card statement arrived and I saw a $999 charge on it for a 12.9-inch iPad Pro. Did I really need a new computer that much? Especially as the previous model sold for $200 less. It’s not clear what about this tablet makes it worth 25 percent more than its predecessor. Especially as most of the improvements in the larger 2018 iPad Pro version aren’t ones that should have added to the cost to produce it. A USB-C port isn’t more expensive than a Lightning Connector. Shrinking the screen bezels actually gave less room for a battery, and a smaller battery should cost less, not more. The situation is somewhat different for the 11-inch iPad Pro. This replaced a 10.5-inch model so a price jump from $649 to $799 is a bit more justified. Still, that’s a 23 percent increase in cost. Apple’s move from its proprietary Lightning Connector to USB-C is long overdue. But, as it stands now, the switch doesn’t bring much benefit to these new tablets. With a USB-C hub, the new iPad Pro can connect to an external monitor, transfer images from memory cards into Photos, use a wired keyboard, and connect to an Ethernet network. Every single one of these could be accomplished with the Lightning Connector and the appropriate adapters. Which isn’t to say that there aren’t advantages to USB-C. The 2018 iPad Pro can use an external monitor, memory card, keyboard, and Ethernet all at once, while earlier tablets could only use one at a time. And the USB-C hub is far, far cheaper than all those adapters. But the move didn’t bring new features. It’s still not possible to transfer files from the iPad to a memory card. An external screen can only play video or mirror the primary screen and nothing else. We’re left hoping iOS 13 will bring the features we want. For the most part, the move from Touch ID to Face ID is welcome. It allowed Apple to shrink the screen bezels, making the 2018 iPad Pro models noticeably smaller and lighter. And facial recognition is quick and relatable. But Apple put the Face ID scanner in a very inconvenient place. It’s in the middle of one of the short edges, exactly where your hand is when holding the device in landscape mode. Almost every time I use Face ID, I have to be reminded to move my hand. This gets irritating. By contrast, the fingerprint scanner on previous iPads was perfectly placed to use when holding the device in landscape mode. 4 Where are the accessories? Changing the size of the 2018 iPad Pro means that it’s incompatible with every case designed for its predecessors. That’s not unexpected. But nearly a month after the wraps came off these tablets only a handful of cases have been announced. Apple, of course, had a folio case and a keyboard folio available immediately. OtterBox and Speck stepped forward to announce some cases. Brydge unveiled a beautiful clip-on keyboard. But Logitech and ZAGG make some of the best keyboard cases for previous iPad models, and so far we’ve heard not a peep from them about the 2018 devices. And most of the cases that have been announced aren’t out yet. Apple should share the details of its products with third-party accessory developers months before the release. Sure, some of this information will leak out but that happens anyway: we knew almost everything about the latest iPads long before they were unveiled. Having accessories to choose from at launch will help spur immediate sales of Apple’s tablets. Anyone who has an older iPad already has a rich array of folios, keyboard cases, etc. to choose from. Anyone who upgraded can only look at these with longing. Two years after ejecting the headphone jack from the iPhone 7 and all subsequent handsets, the 2018 iPad Pro is the first without this handy port. The result is that my very nice over-ear wired headphones are left gathering dust. And Apple didn’t bother to include an adapter to let headphones plug into a USB-C port, which just feels rude. They cost only about $4 online, and one really should have been included in the first iPad without wired headphone support. There’s a big difference between wondering if I made the wrong decision and deciding I made the wrong decision. 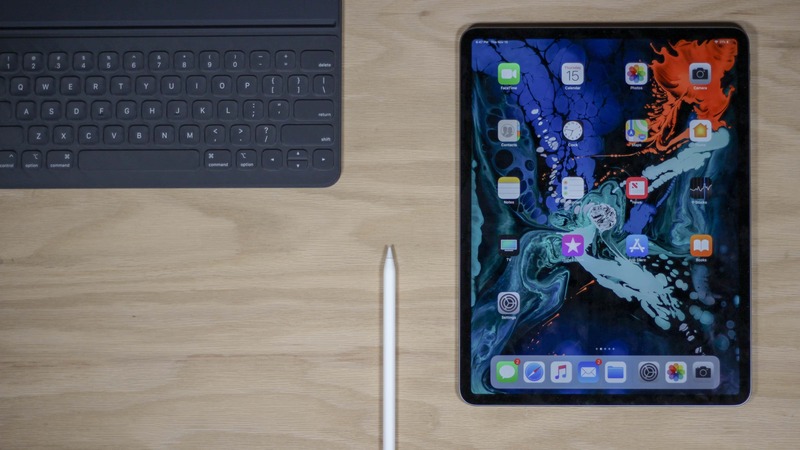 Despite the issues discussed, shrinking the footprint of the 12.9-inch iPad Pro without reducing the size of the screen is the best decision Apple has made for its tablets since it stopped offering just 9.7-inch models back in 2015. The greater portability is truly significant. And some of the problems will be fixed over time. iOS 13 could make USB-C far more useful, and surely accessory makers will announce more cases for this model before too much longer. Eventually, I’ll get used to the poor placement of the Face ID scanner, and I’ll buy my own USB-C headphone adapter. It would have been nice if all of these issues had been taken care of before the launch of the 2018 iPad Pro, though.